Merry Christmas! Can’t believe it’s the end of the year already. Seem like yesterday we were both ill and watching last year’s fireworks from our living room and freezing in the brutally cold winter, and here we are again. 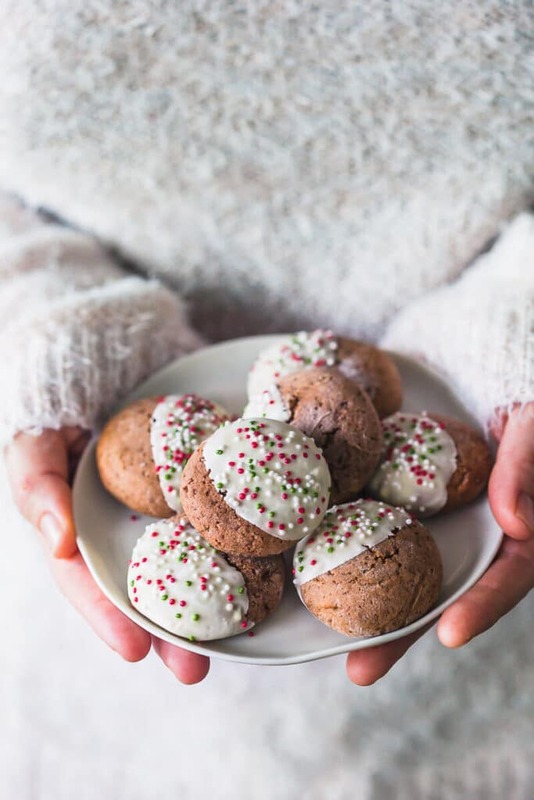 As I am writing this it’s Christmas’ Eve morning, the sun is finally showing after a couple days of fog, and I have a family lunch to prepare in just minutes, but I wanted to share these beautiful cookies with you and wish you peaceful holidays before I sign off. I’ve said before, but making cookies is something I usually do not particularly enjoy. I rarely make cookies. Like, I will do it once a year for holidays, and that’s it. The whole process to me is just tiresome. Making the dough is the easy part. Waiting for the dough to set, I can take that. Cutting cookies, not so much. And then baking them, that takes some time as well. But then spending hours decorating them as well? Not my cup of tea. 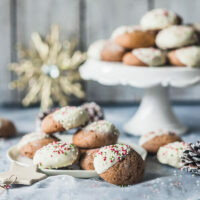 That’s why I love simple cookie recipes, like these Soft Gingerbread Cookies with White Chocolate. The dough comes together in no time at all. There is some chilling involved, but you can do other things while the dough is setting…. then just take a spoon, scoop out a bit of dough, roll it into a ball, press down and that’s the cookie shaped! I baked these cookies 2 trays simultaneously, so I only had one baking batch to make, so that was just to my taste. And because it’s Christmas and I am feeling festive, I even decorated them, which is so not my style! I got some delicious white chocolate (use vegan to keep the recipe dairy-free! ), that I just melted and dunked the cookies in the chocolate, then sprinkled some festive sugar pearls on top, and that’s it! Doesn’t it just look like Christmas? And well, not to mention the taste. I LOVE gingerbread. I’ve been making everything gingerbread-flavored, like this absolutely amazing Gingerbread Hazelnut Granola. And when would we enjoy the gingerbread flavor, if not at Christmas, right? So, I hope you like this recipe and get to spend these holidays with the ones you love. We are now off cooking and enjoying Christmas. 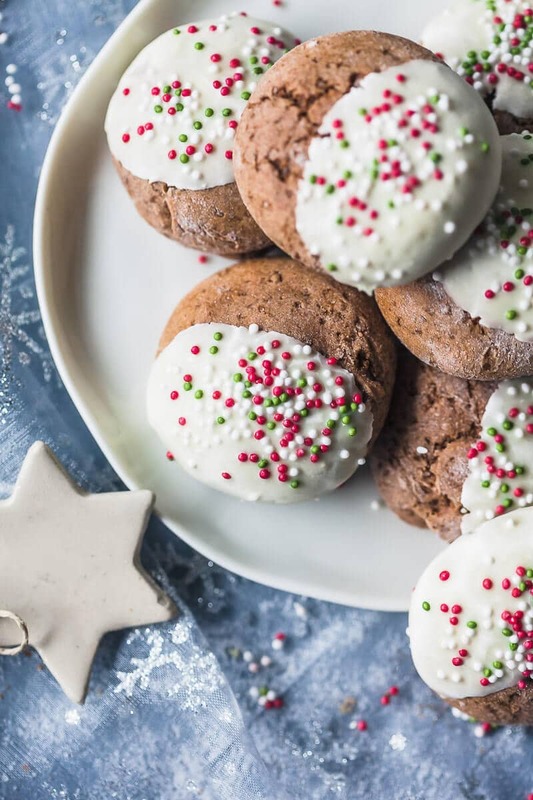 And don’t forget to indulge in some hot cocoa and these Soft Gingerbread Cookies this evening. It is Christmas, after all. In a large bowl combine dry ingredients: rye flour, baking powder, sugar, gingerbread spice mix, ginger spice, cinnamon and cacao. Crack eggs in a separate bowl and whisk, then add to dry ingredients. Lastly, add honey to the mixture and knead in cookie dough. The dough will be sticky, if needed you can add a bit of wheat flour, to make it more managable. Then, cover the bowl with cling foil and place in fridge for at least half an hour to set. Remove dough from fridge and with a teaspoon, take out small bits of dough and shape into a ball. With your thumb press down the middle of the ball to flatten it. If your dough is still sticky, dust each dough ball lightly with wheat flour when shaping. Place each cookie on a baking tray lined with baking paper and repeat until you use up all of the dough. Place baking tray in preheated oven and bake 12 minutes, then remove from oven and place cookies on a rack to cool off. Once the cookies are cooled, decorate with white chocolate. Use a vegan brand to keep dairy-free. Break chocolate down into small pieces and place in a steel bowl and over bain-marie (water bath) to melt. Stir to ensure an even melt. 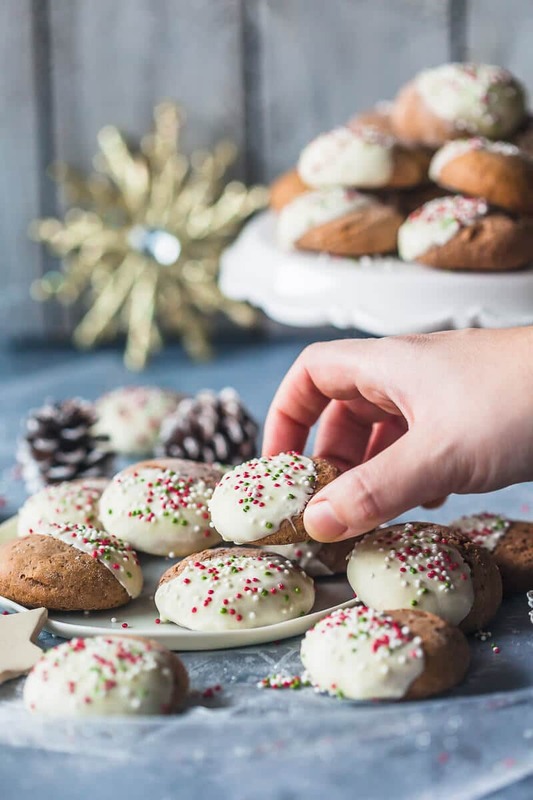 Dunk gingerbread cookies in white chocolate until half covered, drain the excess chocolate and place cookie on a tray lined with baking paper to set. Sprinkle with sugar pearls on top. 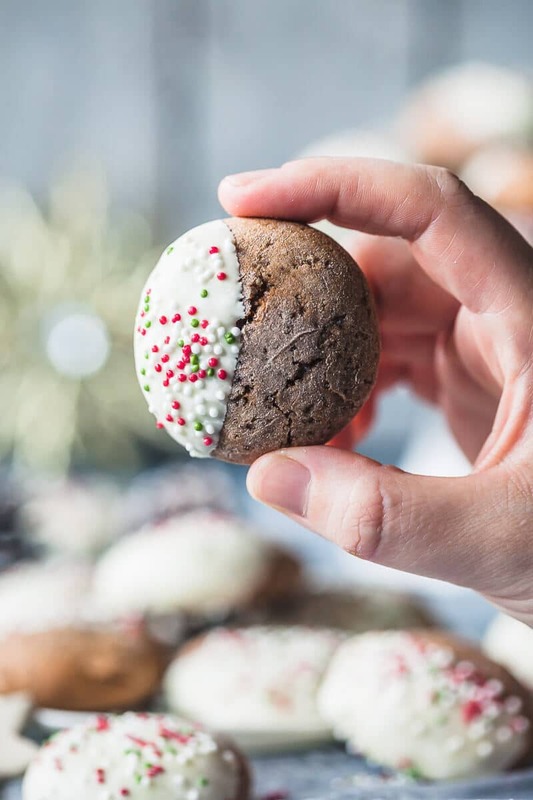 Repeat until you decorate all of the cookies, then place them in a cool room or fridge to set the chocolate quickly. 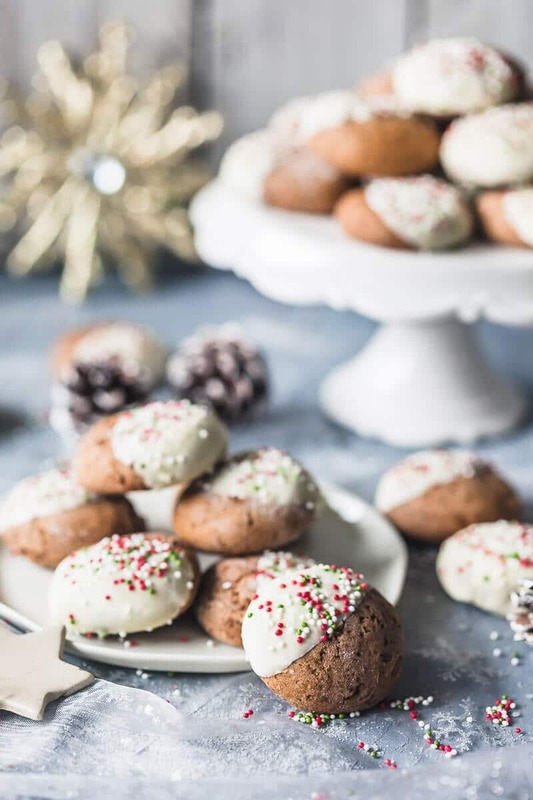 Store gingerbread cookies in an air-tight containers to soften up.